Pasta with a parsley pesto is sufficient for a midweek dinner. However, with a strapping young lad at the dinner table I decided to add chicken sausage to give it a little substance. Dinner does not get any easier than this. Dinner is ready in the time it takes to boil the water and cook the pasta. For us, a one dish meal. Place a large pot of water on the stove over high heat. Cook the sausage and prepare the pesto while you are waiting for the water to boil. If the sausage is in casings, remove the casing and break up the ground chicken in a skillet over medium high heat. Add 3 smashed garlic cloves to the skillet. Continue to cook until nice and brown. Lower heat to keep warm. For the parsley pesto, place all ingredients in a food processor and whirl until blended. If you are not using a food processor, finely chop the parsley, scallions and garlic, place in a bowl with pecorino, olive oil and pepper flakes and stir well. Once your water is at a roaring boil add a tablespoon of coarse grain salt and drop your pasta in. Cook until al dente, linguine cooking time is approximately 9 minutes. Drain pasta, return it to the pan (off the heat) and toss with pesto and sausage. Divide into serving bowls and serve with freshly grated pecorino. This would be fab with crab meat too! :) Don’t you just love pecorino?! Nothin’ wrong with easy! Simple so that every flavor shines through. Yum. And I love your place setting. Great food, great shot! Nothing better than pesto with pasta! Yum! We are big on pesto made with many different herb/nut combos, but never teamed any of then with sausage. Thanks for the inspiration, it looks delicious. Me too! Your are welcome, hope your use sausage with your next pesto pasta! You’ll love it. I’d be happy with the parsley pesto! Yet, I keep reading about Italian sausages, something I’ve never had. They’re not for sale here, unless you’re lucky enough to have an Italian deli nearby. Which I don’t. Shame! I’m so curious what town you reside! It’s ok to be curious though…no need to share. :) We buy them in the regular markets over here. One of my favorite ingredient in an italian sausage is fennel seeds. Always nice to find one here and there while chewing. Too bad I have given up on pasta.This is tasty stuff! Wheat free (since Dec and I love it)! I know it’s possible to get wheat free pasta and stuff but I like to test my will power! This looks very tasty tho. This looks really, really tasty. Thank you too! So nice to find your blog. Just tonight I prepared a similar dinner, using homemade sausage in place of the chicken sausage that you used. It was a great dinner and I’m sure yours was every bit as good, if not better. Yum! Yummmm.. Homemade sausage. My brother makes homemade elk sausage and it is fabulous! We are in synch with our dinners, aren’t we? I hope you made it! You will not be disappointed! I just love parsley!! Never thought of making pesto I love this!! I am making this tonight. Really? I would love your feedback if you do. I love parsley pesto and I think I may like it a bit more than basil pesto. I have even made cilantro pesto too, which is really good. Delicious and with a large bunch of parsley and pecorino romano! I actually finished my huge bunch of parsley this time. Thanks for sharing, my next pasta dish will have lots of parsley as well!! Yum! You already know how much I love pasta & Italy, so when I popped over to your blog (from the comment you left on mine), I fell in love with this recipe. Haven’t had linguine in a good long while…might be time for me to make some one day! Love pasta and this looks beautiful. On the shopping/cooking list for this week. thanks! Oh great! Thank you so much. It is a winner of a recipe! I made this tonight for dinner (Larry’s still washing up the dishes!) and it was as delicious as it looks in your photo. so garlicky. I used basil in place of the parsley because it’s growing in the yard. thanks again for the great recipe! i would like to add some chopped kalamata too to the dish…..
That does sound like a great add in! Thanks! We love pasta with pesto in our home. Actually, we love pasta with anything in our home! This dish looks great and would make hubby quite happy… if I make JUST pasta, his first question is always, “Where’s the meat?”. This would be perfect! That is so funny! I get the same remark from my 15 year old son! Always….”where’s the meat”. (I have a tendency to cook without meat). Ha! The chicken italian sausage was fabulous in this! I love fennel seeds in my sausage. 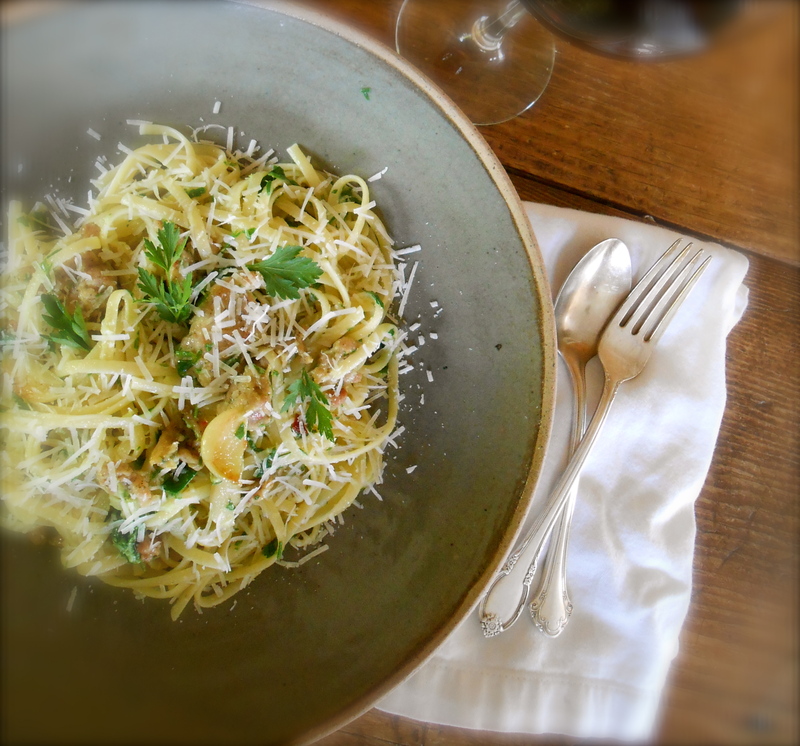 You are currently reading linguine with chicken sausage (linguine con salsiccia di pollo) at COTTAGE GROVE HOUSE.